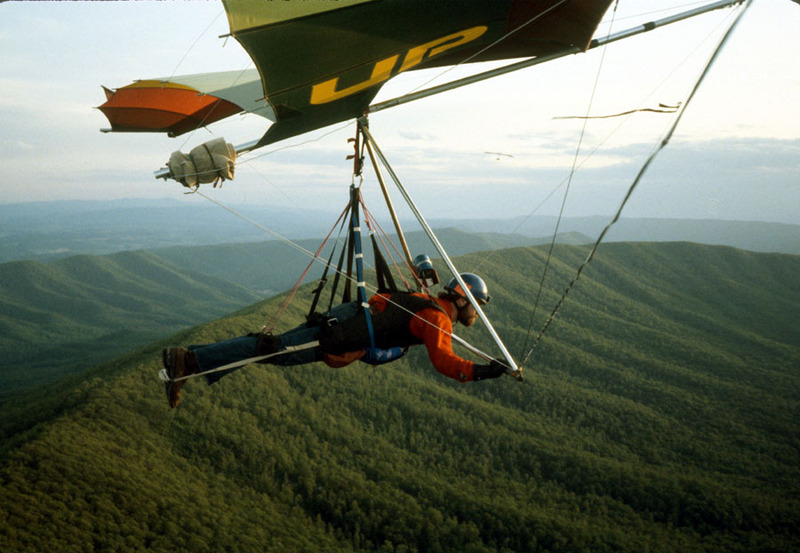 The UP Mosquito is a rare bird along the evolutionary path of hang glider technology. 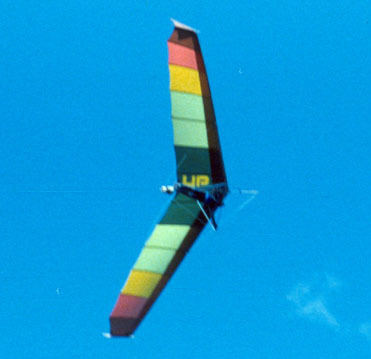 It was a high aspect ratio single surface glider with a number of innovative features that gave it an excellent glide ratio and very easy handling. It was also my first mountain glider and so still has that unique fondness that comes with first loves. The Mosquito had an Aspect Ratio of 7.4, which was higher than any flex-wing glider of it's time and similar to the highest values even 30+ years later. Aspect Ratio is a measure of the narrowness of a wing, calculated from the width and area. 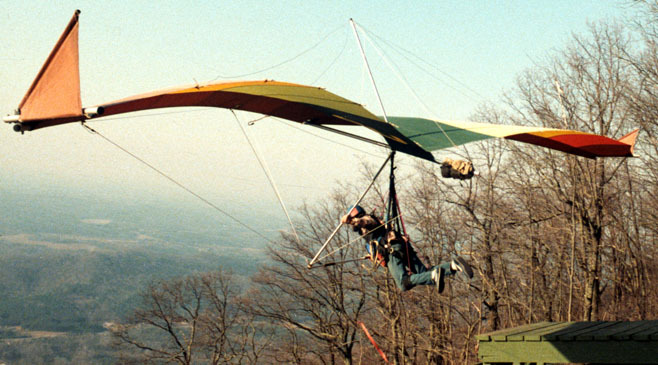 Wills Wing's highest aspect ratio glider of 2011, the T2, has the same 7.4 aspect ratio as the Mosquito. A delta-wing glider needs a structural component to keep the leading edges held out in the V-shape. Without something to maintain the design nose angle, the leading edges would fold up like an umbrella. Normally the leading edges are held in position by cross-spars - cross span tubes that are loaded in compression. Because buckling is a concern on a slender member undergoing compression loading, the cross-spars are typically large diameter tubing, often even larger than the leading edges. On a single-surface glider these spars are directly in the airflow beneath the wing and can add a large drag force. 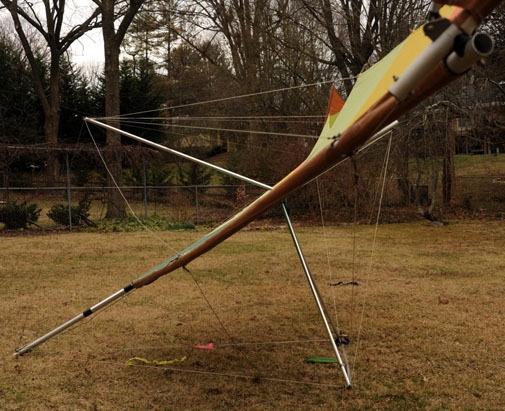 The UP Mosquito used a different approach that is typically referred to as a bowsprit design. Instead of cross spars in compression, the keel tube is extended forward of the leading edge junction, and cables reach back from the tip of the nose to the leading edges. This accomplishes the same function as the cross spars, but without the drag of the large tubing. Of course, in the Mosquito design, a number of extra cables replace the two tubes, and there is a drag penalty from the extra cables. This is the term UP used to describe their wing shape. This design uses a curved leading edge to minimize the drag from mid-span "washout", similar to the earlier Seagull hang gliders. Rather than try to control the upward bow of the sail trailing edge at mid-span, the leading edge is allowed to bow upwards to match it, thus reducing drag. Unlike the fixed shape of the Seagull leading edges, the Mosquito leading edge was straight when unloaded, but flexible. Two sets of cables support each leading edge - one set near the ends of each leading edge, and another set at the more normal mid-span location. The outboard cables were tight, but the mid-span cables were slack, so the middle section of each leading end could bend (both up and down). This allowed the leading edge to bow upwards (until the mid-span cable became tight) once the wing became loaded. It also allowed the leading edge to bend downwards when encountering turbulence, a feature designed to decrease the loading caused by turbulence. On the ground, however, this design made for a very UN-aerodynamic looking wing as the sail was very nearly completely flat. Together with the long nose, this inspired a number of jokes about it looking like a Lawn Dart (one of those extremely bad ideas for a lawn toy that was eventually banned). Once in the air, however, aerodynamic forces would cause the true wing shape to emerge, which was sleek and efficient. 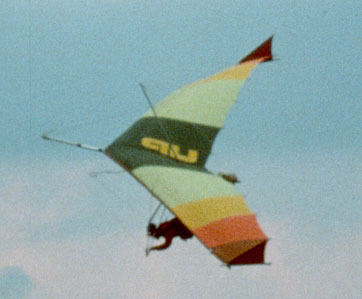 It's maximum glide ratio (L/D) matched that of many of the newer "double surface" gliders that eventually replaced it. "The most important function of the polycylindrical wing shape, however, is as a pitch stability system. When the angle of attack of the Mosquito gets below approximately +10 deg, the leading edges start moving downward toward their lower position. As this occurs, the positive pitch stability gets stronger and stronger. This occurs because the the wing has far more washout when the leading edges are in the full down position. When flying in smooth air, the leading edges will never leave their normal flight position. This is because the extra stability force isn't needed." The Mosquito design incorporated "truncated" wings, or, as UP referred to them, trunctips. The most commong wing design is tapered wing tips, used to minimize cross-span flow, which results in vortices generated at the wing tips and a loss of efficiency. An alternate approach, which was used by the Mosquito, is to square the tips and use vertical "winglets" to reduce this flow. The Mosquito added an additional tweak to this general design by making the tips and winglets moveable. 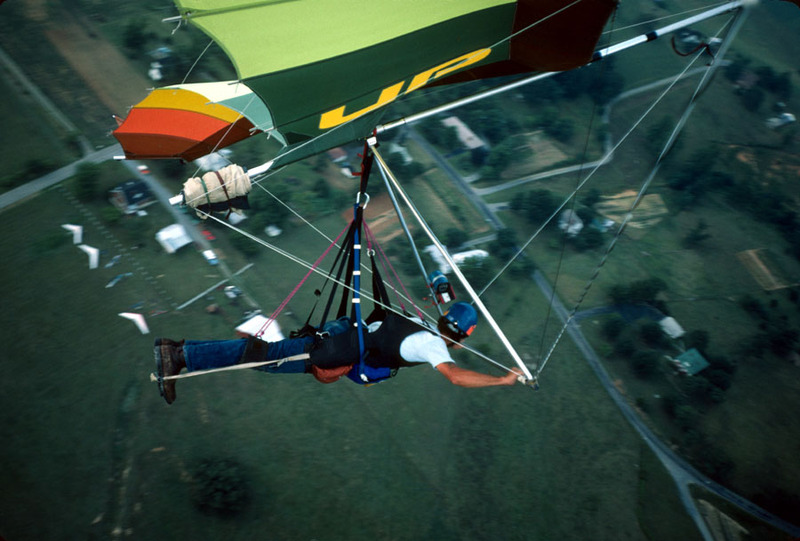 The tips were not controlled directly by the pilot, but indirectly, coupled to normal hang glider control inputs. A cable from the tip of the nose passed around a pulley on the leading edge and then to the forward end of the trunc-tip. When the pilot made a roll input, the free-floating keel would pivot sideways around the leading edge junction, causing the trunc tip cables to alternately loosen on one side and tighten on the opposite side. This would cause the trunc-tips to rotate, changing the angle of the winglets and also tightening or loosening the sail differentially on the two sides. The result was an extremely responsive glider. The Mosquito did some things very well, but not so on others. It was designed to be fast, efficient, and easy handling, even in the Big Air. 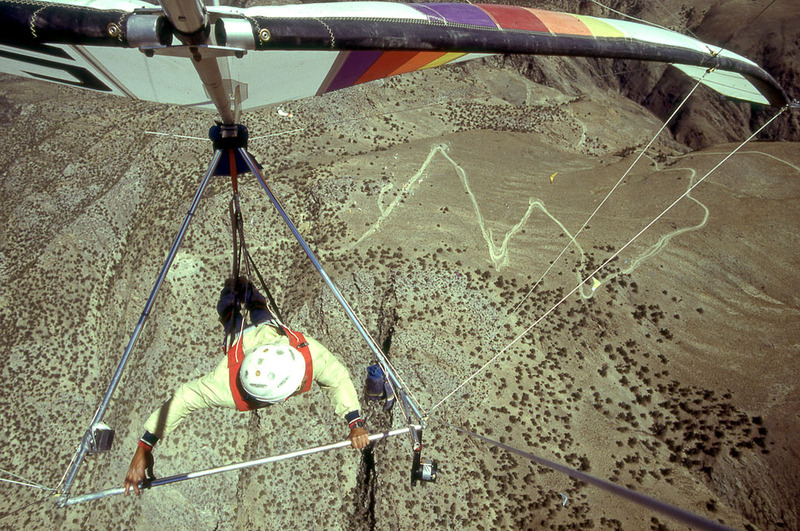 In fact this glider seems to have been designed specifically for the strong conditions seen in Owens Valley, mid-summer. That is where the glider would call Home. Unfortunately, I was an East Coast pilot, where typical conditions are often very light requiring gliders with an excellent minimum sink rate. Alas, Minimum Sink was not one of the better specifications of the Mosquito. The 166 model actually only had 163 square feet of sail area, which was very small for that time, especially for a single surface glider. It could fly fast and efficiently, but not slow and efficiently. The glider that could win speed tasks in the Owens was not so good at staying up on light wind, Eastern days. Still, that did not stop me from becoming very attached to this unique and easy handling wing. One of the best features of the Mosquito had to be it's easy handling. In fact, I was later to discover that it was almost too easy. As a new mountain pilot I found myself flying on stronger days than might be normal for a new pilot, because those were the only days I could have a chance of soaring on the Mosquito. I would often be mystified, afterwards in the LZ, to hear more experienced pilots complain about the rowdy air and massaging aching muscles. I didn't believe I was in any better shape than they were, but I seldom thought it took much effort to fly in turbulent air. What was I missing? 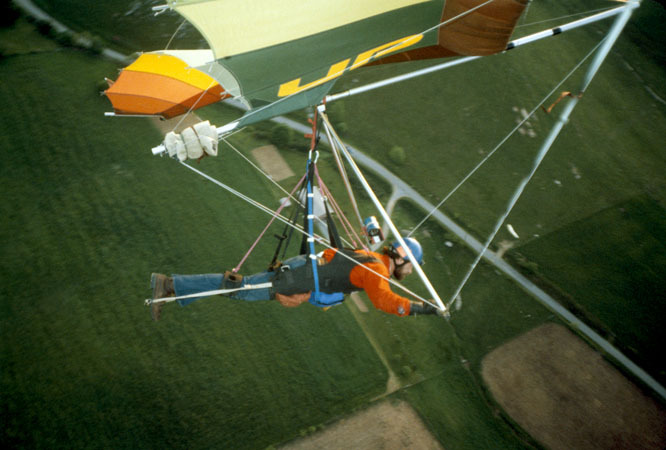 It was only when I got my next glider that I discovered what everyone had been complaining about - rowdy air could be a workout! I never really appreciated how easy handling the Mosquito had been until I started flying 'normal' gliders. Even for a new, low time pilot such as I was, the Mosquito delighted in effortlessly standing on a wingtip whenever I desired a 'wang'. A year or two later, while out on the training hill with some students, I decided to fly it again for Old Time's Sake. Fortunately, I survived, although it was not a sure thing there for awhile. Shortly after launch a wing tip lifted slightly, and I made a mild (by the standards of the glider I was currently flying) tug to correct it. Almost immediately I was in a steep (60 deg?) bank turn. Suddenly alarmed, I tugged in the opposite direction, and found myself in the same situation, only banked in the opposite direction! I had only been about 100 feet up the hill, and I was quickly running out of altitude. Fortunately I was able to recalibrate enough to get the glider sufficiently leveled to land. With some newfound respect I made a couple more flights, but I was only able to reduce the PIO's (Pilot Induced Oscillations), not eliminate them. 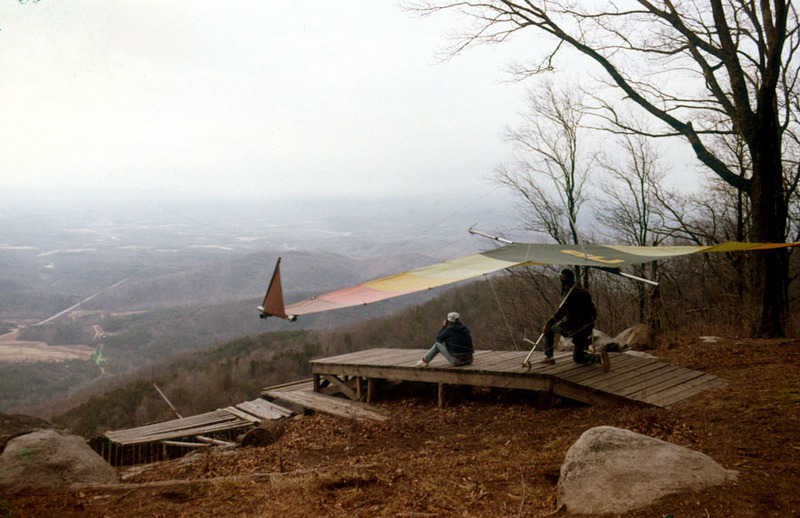 I took the glider to the training hill a couple of other years, but I was never again able to fly it like I had been able to when it was my primary glider - the control forces were simply too light compared to what I had become used to flying. Yet, when that was the only glider I flew, it seemed effortless to track in a straight line even in turbulent air. The last time I flew it was in 1991, from a 1400 foot site. I picked a calm day and used only the thumb and forefinger of each hand on the basetube. Even so, it took maybe a third of the flight before I was able to completely eliminate the oscillations. Today, as a much older and grayer pilot, I have no desire to try flying it again, but I would approach it with great caution if I did. "In very turbulent conditions (the leading edges) might cycle several times a minute, but only as a result of the angle of attack going below the normal range several times. This may be a little noisy, but you will get used to it quickly." Not only are the sidewires slack, but the left leading edge has moved down and the sail near the tip has a reverse curvature. I don't recall it being particularly challenging in terms of control forces (the design worked as promised) but it was definitely noisy, catching the attention of those still on launch (and persuading some to tear down without flying...). It only happened once during that flight, which was a relief - but I was amused (after being safely on the ground) to reflect on the statement about "might cycle several times a minute" - not air I would care to be flying in! "Twenty preproduction prototypes were built for top U.S. competition pilots to evaluate in the world's most demanding cross country event, the XC "Classic" and "Open" Competition in Owens Valley. The result? First Place: Rich Pfeiffer -- UP Mosquito. In addition, UP Mosquitos placed four in the top eight places, won every speed task, and set three new world's records for hang gliding." 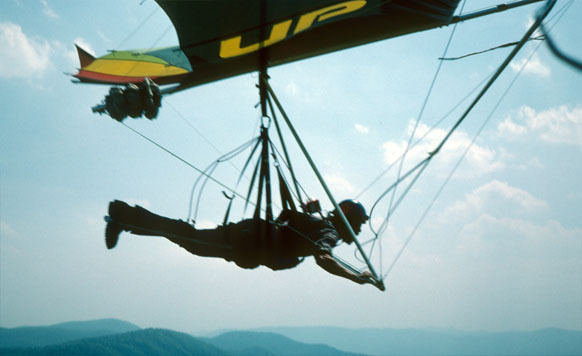 The following year, UP released the double-surface Comet, which enclosed the cross-spar and forever changed the direction of hang glider design. The Mosquito slipped quietly into history.